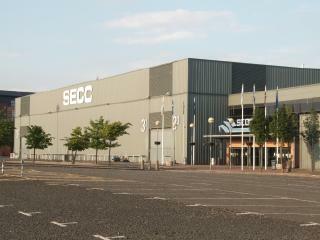 Opened in 1985 and built at a cost of £36 million, the SEC Centre or Scottish Exhibition and Conference Centre is situated on the site of the former Queen's Dock, a mile (2 km) west of Glasgow city centre and on the northern bank of the River Clyde. Comprising five interlinked halls, it has an area of 19,000 sq. m (204,500 sq. feet) and is the main city venue for pop concerts, conferences and trade exhibitions. The city's annual Christmas Carnival takes place here, while the boxing, gymnastics, judo, netball, weightlifting and wrestling events for the Glasgow Commonwealth Games of 2014 were also held here. Nearby stand the Clyde Auditorium (SEC Armadillo) and the SSE Hydro, while across Bell's Bridge over the River Clyde are the Glasgow Science Centre, Imax Cinema and Glasgow Tower. At over 13.3 ha (33 acres), the Queen's Dock was the largest in Scotland when it was built. Constructed between 1872 and 1880 at a cost of £901,000, it was divided into a North Basin and South Basin, both opening into an Outer Basin. The dock complex included extensive goods sheds and railway sidings that connected to the Stobcross Branch of the North British Railway. The Queen's Dock operated until 1969 and was infilled in 1977 using rubble from the demolition of the St. Enoch Railway Station and Hotel. The Glasgow City Heliport once occupied a site to the west at the end of Stobcross Quay.